Many ancient Greeks would not eat beans because they were thought to hold the souls of the dead. They are many herbs used commonly today that many people do not realize have been adored for millennia since the times of Ancient Greece. Elaborate myths were built around these medicinal plants highlighting their sanctity and believed origin. Keep reading to see how their medicinal uses still apply in the present day. In Greek mythology, the mint plant was cherished by Demeter, the goddess of harvest, and her daughter, Persephone. It was said that mint was made from a Nymph named Minthê who was favored over Demeter by Hades (the god of the dead). In jealousy and anger, Demeter turned Minthê into a mint plant. Mint was used to treat gastrointestinal issues, body odor, bad breath, and insomnia in Ancient Greece. Today, it is additionally used for treating bronchitis, headaches, influenza, motion sickness, and muscle pain. Fennel was first known in Greek mythology as the plant Prometheus used to steal fire from the demigods. It was also the herb that covered the battlefield of Marathon. It's used medicinally to relieve all manners of digestive disorders, especially bloating. This sweet herb can also stimulate appetite, and it touts diuretic and anti-inflammatory properties. The olive tree was the most relished tree in ancient Greece. It was especially important to Athena, the goddess of wisdom, war, and divine intelligence; and Zeus, god of sky, thunder, and justice. Athena and Poseidon contended against each other to rule Athens. They were told whoever produces a better gift will win. Athena produced an olive tree, and Poseidon, a horse. Athena won. Her victory may be due to the plentiful benefits that olive oil and olive leaves have to treat a wide variety of ailments. The leaves can be used to treat arthritis, prevent diabetes, and lower high blood pressure as well as improve brain function. Olive oil protects against cardiovascular issues and strokes. In Greek myth, parsley is believed to grow from the ground soaked with the blood of Archemoros (also known as Opheltes of Nemea). The ancient Greeks, who believed parsley seeds made several journeys to Hades before germinating, used the herb as an aphrodisiac as well as in funeral ceremonies. In modern herbalism, parsley seeds are used as a strong diuretic and kidney-cleanser, and the leaves are a good source of nutrition in salads, rich in vitamins A, C, and E.
Saffron was sacred to Hermes the son of Zeus, and god of transitions. In mythology, there was a boy named Krokos, whom Hermes adored. When he died, Hermes transformed him into a saffron flower. This exotic spice was loved in ancient Greece, and it continues to be used in much spicy cooking in modern times for its unique flavor and medicinal properties. It helps fight depression, boost immunity, and aid in digestion. This is due to its high content of crocin, vitamins, and antioxidants. 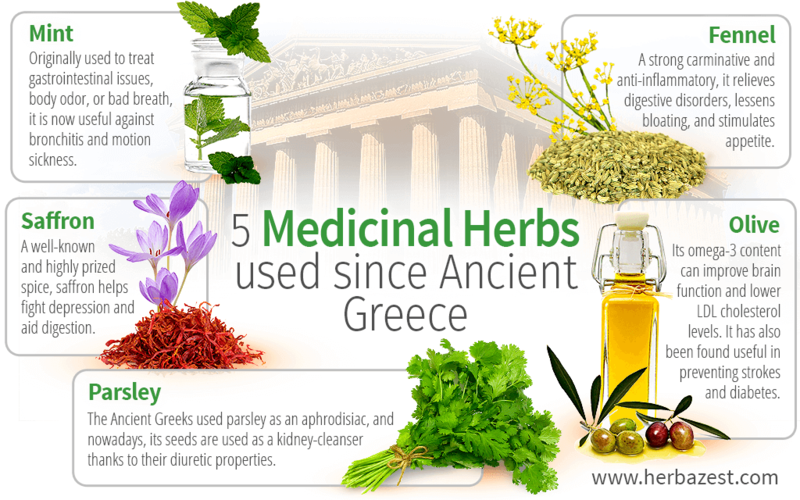 When enjoying these wonderful herbs from ancient Greece, maybe you can make a story of your own for what they mean to you. Otherwise, just feel and savor their numerous medicinal and nutritional benefits.